All I have done so far in the nursery is this little table that is going to be in one of the corners. I thought I would share because it's a preview of what the nursery will looks like. The walls are going to be painted the same chocolate brown that the table cloth is. That pink and brown zebra is going to be the main material in the bedding. It's also going to have a little giraffe print and a little hint of green in it. I think it's going to be soooooooo cute! I got that lamp at T J Maxx last week. I love it. In this picture - it doesn't really look right but it's a great shade of pink and has little crystals hanging down. SO girly! This weekend I will start working on a project for one of the walls. I've got this frame hanging up in my office right now - with vacation pictures of Scott and I.
I'm going to paint the frame silver with pink in it. And then I'm going to paint the mat with giraffe print and put pink scrapbook paper as backgrounds for each picture and I'm going to frame some of Harper's ultrasound pictures (6 wks, 11 wks, 20 wks, and the 3D ones we will have made in a few weeks) and then when she is born we'll put a good picture of her right in the middle. I think it will turn out neat (I hope) and I wanted a neat way to frame her ultrasound pictures. I'll post after pictures next week. Hopefully it won't be too ugly. Little Harper's nursery is going to be so precious! I really love all the neat and creative ideas you have ;)! It's going to be beautiful Kelly! I love to see little girl rooms since I don't have girls. Can't wait to see the finished product. Love it! I love PINK and brown together...really just love PINK! 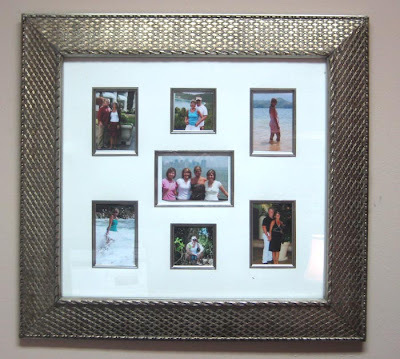 The frame idea is awesome! Can't wait to see it finished! All I can think every time I read your blog is how God has perfect timing and how much you get to enjoy this at this time in your life! Any other time and it may not have been so sweet, but b/c you were faithful...you get to reap the rewards of His glory! I love the table! So girly!! I had 3D ultrasounds done with my first pregnancy and they are amazing. We decided not to have them done with our second one because we did not find out what he was. I think the frame is going to turn out adorable!! Oh, everything is just precious! I can't wait to see more, more and more-more! Oh I just love it!!! Those are my favorite girl colors! This is going to be soooooo precious!! I bet you are enjoying the decorating so much! 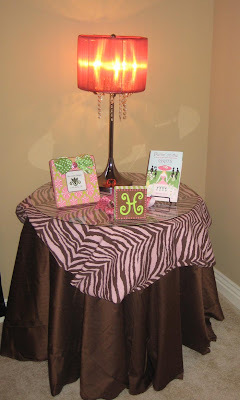 The pink and brown look so good together and with that zebra print the bedding is going to be fabulous! What a lucky little girl Miss Harper is! God Bless! LOVE LOVE LOVE the zebra print!! She is going to be such a luckly little lady in her chic room!! Enjoy yourself - my favorite hobby is decorating the kids' rooms!!! 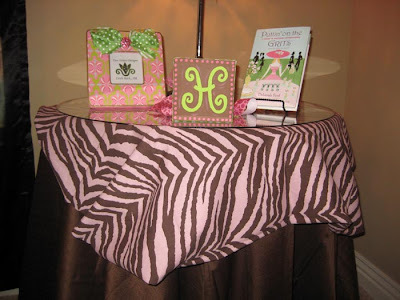 Love the zebra print as well the as the chocolate brown with the pink! It is going to be super cute!Can't wait to see how your frame turns out as well! Can't wait too see the rest of the nursery! Harper's room is going to be so cute, she will love it! LOVE it! Harper's room is going to be so cute!!! Her nursery will be precious!!! Love the nursery preview...it will be very girl and oh, so sweet! How cute Kelly! Momma got some style :) Thanks for sharing with us!!! your blog is already popular, I cant imagine how popular it will be when that little girl arrives, and her pictures are gracing the entries!!!!!!!!!!!!! Well, I had to chime in on this one. I love the colors & it's going to be a gorgeous nursery! Have fun, Kelly. and i so need that grits book. my mom soooooo loves all of the grits stuff but i need to get that one for me!!!!!!!!!!! Oh Harper is going to be soooo cute and sooooooo sassy with that room!!!!!!!!! THE ROOM IS PRECIOUS! THAT IS THE COLORS THAT MY MADISONS NURSERY WAS! I SPENT TONS ON THE BEDDING AND STUFF AND SHE JUST RECENTLY STARTED CLIMBING ON THE BUMPER SO WE HAD TO GET RID OF ALL THE BEDDING!!!! SO SAD! JUST YOU WAIT!!!! It's going to be such a cute room! Aren't girls rooms just the most fun to decorate? I love it!!!! LOVE. IT. I LOVE pink and brown, and I especially love it in that zebra print. It is going to be ADORABLE! So cute KellY!!! Harper is one lucky girl! Cant wait to see the picture of the "new and improved" frame! I've never commented before but have been following your story for a while. I find your blog very entertaining. I don't even remember how I came upon your site but have been hooked ever since. I'm from Oklahoma (living in TX now) and had MANY friends that went to OBU. I love your little girl to be name. SO CUTE! Her room will be precious as well. I have two girls (Madeline-5, Macy 2) Girls are SO MUCH fun. I cannot wait to see how it all turns out! You are a great designer!!! :) Harper Brown will love her room!!!! Harpers room is going to be great. I can't wait to see the 3D. They look really neat. My boss had her and her son looked like the picture to a T when he was born. That will be very pretty and sweet. Harper is going to have the prettiest nursery ever! Those are some of my favorite colors for a little girl's room. I know that you are having so much fun decorating and you have some wonderful ideas. I can't wait to see it when it's all finished and with Miss Harper right in the center of it! I LOVE pink and chocolate! That is similar to what I want for our future daughter's room, just polka dots. I can't wait to see it all finished! I don't even "know" you and I am sooo excited for you. I have two girls and I'm in the middle of a big girl redo for my youngest!! Congrats Kelly!! I just wanted to give you this web address, they have some FABULOUS girl bedding. It is where I found my inspiration for my future girl nursery! Of course you can move my name to the baby list...as long as I can still be on the friend list once little bit gets here! I know...we will have to exchange stories!!! By the way, love love love Harper's room! The pink and chocolate are gorgeous!!!! I love brown too and am somehow going to use it! I love all your ideas for Harper's nursery! It's going to be precious!!! I can't wait to see the Harper's room all finished!!! I am so excited for you...I feel like we are such close friends..although we have only met (through blogging) a few months ago. Harper is beautiful and you are beautiful...the nursery idea is so precious! Pink and chocolate and zebra and giraffe! Are you kidding me? I would want to live in that room! Sweet Harper is going to be one lucky little girl, on so many different levels. No way it will be ugly!!!! I'm excited to see it...it sounds silly but absolutely can't wait to post pictures of that kind of thing on my blog! Love the pink and brown. The frame will be gorgeous, can't wait to see it. Oh Kelly, the room is off to a great start. It is going to be so girly and so perfect for little Harper, I can not wait to see it all finished. We have lots of pinks, brown & green in Emma's nursery and there is lots of stuff out there you can find to match it. I am so happy for you. Take a look at my latest post when you get a chance. It will make the Cheerleader in you SMILE! I LOVE the start of your nursery! You are so creative! So cute! I know the nursery is going to be beautiful! Can't wait to see pics! it is going to be adorable..you are going to love brown walls..i did my entry "brownie" and i LOVE IT..it is NOT to dark (dont let anyone tell you that;;) and i lov the idea of the bright green accents..so preppy chic. Have you seen the little tiny green cheetah print..i have seen a lot of stuff trimmed in that..ENJOY EVERY MINUTE! Harper's nursery is going to be adorable!!! I LOVE the zebra print!! I think adding green will be perfect!! You are so creative! I can't wait to see how the frame turns out! The nursery is going to be absolutely perfect!! I love the frame project--great ideas! I had that same fabric picked out for Thomas' nursery...only he turned out to be a Thomas, not a Claire-ha! I love the touch of green-adorable! I can't wait to see the after pics of the frame! Great idea!!!! So cute! Very baby chic!